My grandma recently sent me two huge lawn-and-leaf bags full of fabric, eyelet, lace, trims, buttons, well, a whole bunch of wonderful supplies! There's a huge piece of polar fleece, that I suspect is at least partial wool content (my nose tells me so, but I haven't done a burn test yet)...super soft and cuddly! And scraps of Thinsulate -- the perfect size for making a coat for Miss M or the new baby. Also doll making supplies -- joints, eyes, hair, long doll-making needles, etc. I probably won't use them, but I'm sure someone somewhere would be glad to trade for something I would use. So, as a thank you for her thoughtful gift (I'm just 1 out of her 8 kids and 33 grandkids, so I'm sure she could have passed it all on to someone else! 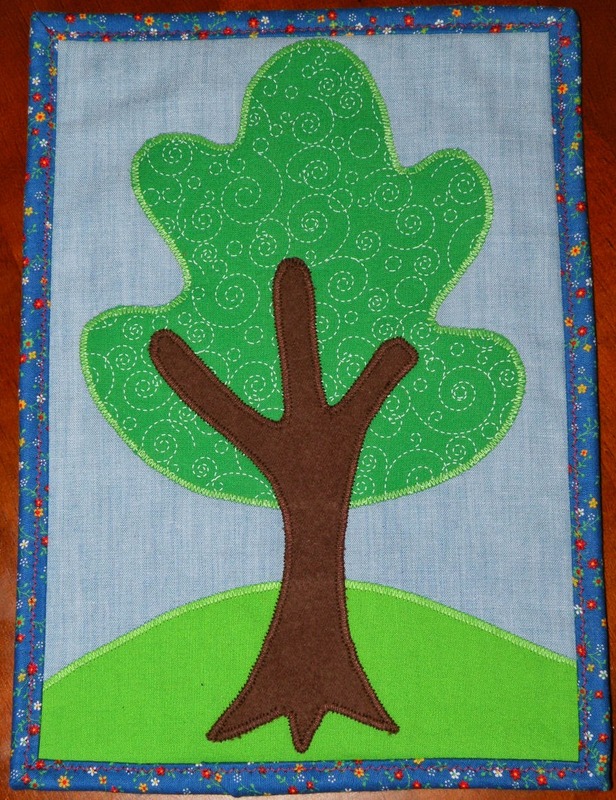 ), I decided to make her a mini tree quilt. It's my first time ever doing a quilt binding and while it didn't turn out perfectly, I'm quite pleased overall! I'm planning to make three slightly larger ones to hang on the walls in Miss M's room. I just have to do some other things first...like finish sewing diapers and her halloween costume. I finally made a mei tai for ME!